Alright lovelies....I did have another Homemade Monday all ready for you, but something interesting happened last week.......I recieved a bunch of e-mails with blogging how to questions. At first I was completely flattered that not only do you guys think I am some blogging rock star with helpful tips, but that you feel you can ask me anything. It was totally a confident boost. I notcied something similar in most of the e-mails. You guys were appologizing for asking in the first place. You felt you should already know and felt bad you didn't know some of the tricks to revamping your blog. Well let me start off by telling you that I am no rock star, although sometimes I wish I was. I have just learned by trial and error. That being said I have decided to deidicate this week to teaching you all how to revamp your blog. Today will be part one. This will end up being a 4 or 5 part series on Blissful and Domestic, which I hope will be beneficial to you all and give you some great tips for adding those personal touches to your blog. To start off I have to tell you that the way my blog looks now is quite dooable for all of you. I didn't pay to have someone do it for me. I thought up an image in my head and made it come to life. This is what I am going to teach you this week. Ok for part one we are going to focus on the header. I have gotten a bunch of questions about my new header. First off thankyou for all the sweet compliments. They totally made my day. Remember your blog is YOURS and should reflect your taste. Don't go with something you think is popular, but something YOU like. I am a girly girl. I don't get to have floral stuff and pinks in my room, for fear of Hubby gagging on all the feminine touches, which is why my blog is as girly looking as it comes. This is me, but it may not be you. Keep that in mind. Your blog is your creative space. Have fun making it YOURS. Now doing a header is very simple. Much more simple than you probably think. The main photo editing tools I use are Photobucket.com and Picnik.com I use their free editing services. Why pay when you can get it free....am I right? 2. Upload a digital scrapbooking paper. 3. Once I have uploaded my picture onto Picnik I then crop it to the size I want. This is the exact size of my Blissful and Domestic Header above. I use a widescreen format in blogger. Make your measurement less if you have a smaller blog width. To extend your blog width go into the "Design" section of blogger, then "Template Designer", then "adjust widths". This is how I make my header centered between my sidebars and stuff. Oh and always preview first and then hit "apply to blog" to make it a permanent change on your blog. 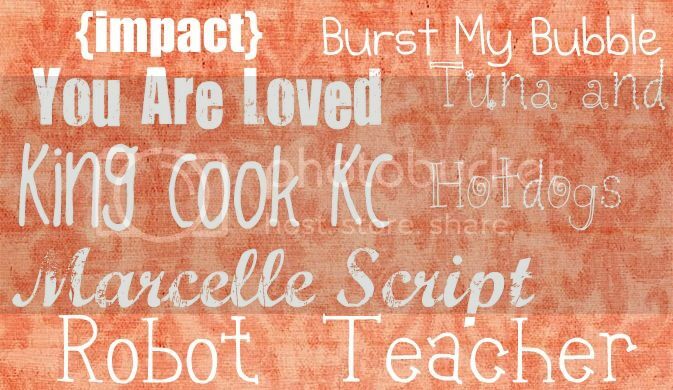 All these fonts are free through picnik. They do have some you have to pay for, but their free selection is so vast you shouldn't have to pay for fonts. So I just went into text and typed"-----------------------------"
You can also adjust color settings in "text" as well. 6. Save your picture onto your comnputer. 7. Go into the "design" section of blogger, then click edit in the Blog Header section. When I upload my picture I ask for it to use that instead of a description and to "shrink to fit" as well. Once this is done click save and you will have a new, fun blog header. Those are lots of fun too! Alright so I hope that now you are able to make a new fun header for your blog. If you have questions let me know. Tomorrow we move onto the tab section and how to really revamp that up. Danielle, thank you so much!!!! I love reading blogs, yours included, but didn't have the confidence to try one on my own .... you, dear girl, with this posting, have encouraged me to give it a whirl. Now I have to think up a clever name, etc. - decisions, decisions, decisions. I am grateful to you for sharing this and look forward to more lessons. Well, son-of-a-gun I've already run into a hurdle!!!! Blogger won't accept any "names" I use so what's a girl to do, lol. I am so excited you are doing this little series! I am the same with not wanting to ask someone for help, but dang if you are going to post about it I am in heaven right now...THANK YOU! I have a blog header!!! Woo Hoo! You don't know how exciting this is for an old gal. Thanks so much for sharing what you've learnt along the way! It's so helpful! This is perfect! One of my blog resolutions for the year was to change my blog look to something more personal, but I really had no idea where to start! Thanks so much! This is awesome, thanks so much for the fabulous tutorial, way appreciate it. I'm still a newbie to blogland, so I need all the help I can get. Excited to be your newest follower! Great Tute Danielle - you've explained it all so well and so clearly! TFS!! Great tutorial. I'm stopping by from Strictly Homemade linky party and a follower. Thank you for covering this info. I am new to the blogosphere and feel my blog is so sad. I can't wait to give it some bling! Thanks so much for this, I just started my blog and just grabbed something cute but now I can make my own, I am so excited. If you have a chance to check mine out I would love any feedback! www.missinformationblog.com. Just posted a link to your blogging posts and your blog on my post today! Check it out! I have been wanting to make a blog button with a new blog name for quite some time now. I really did not want to have to start a new blog and the name I have now is really appropriate for us anymore ... it isn't personal and I didn't think enough before naming it when I first started blogging. I am in dire need of revamping!!!! I have this on my immediate to do list. I somehow made it to your blog and I am VERY thankful that I did! This may be a silly question but is a blog header the same thing as a blog button. So, your header at the top is banner size - right? Thank you so much for your post. I got my blog looking amazing thanks to you. I am hopefully going to be a new blogger with a blog about all my crafts. Thanks again! Now--to figure out how get the follow-me tabs! Another great tutorial, thanks again. Still haven't been able to master the tabs but I'll get there. :) Thanks for the time put into this it has helped greatly! I'm going to try this sometime within the next four days. I've been looking at free online banner makers, but most seem so limited and I've always been scared to try and change the one in Blogger. Someone else actually added it for me, but it's so dated. I've already changed the overall color of my blog now for the header then working on fixing tabs. Tab question: One of my tabs goes to the home page no matter what - even though the text within the text editor has the post I actually want there. Do you know how to fix that? With what you instructed here can photos also be added? I guess I can just check it out and see, huh? I've just entered the blogging world (scary!) and am very much learning as I go. I'm definitely blogging on a budget and was very unhappy with my generic header. Your tutorial helped me create a better header I and much more happy with. It may still be simple but I'm currently happy with it. Thanks so much for sharing! I've linked this tutorial on my site at www.becomingahome.com. There is a very good alternative like picnik.